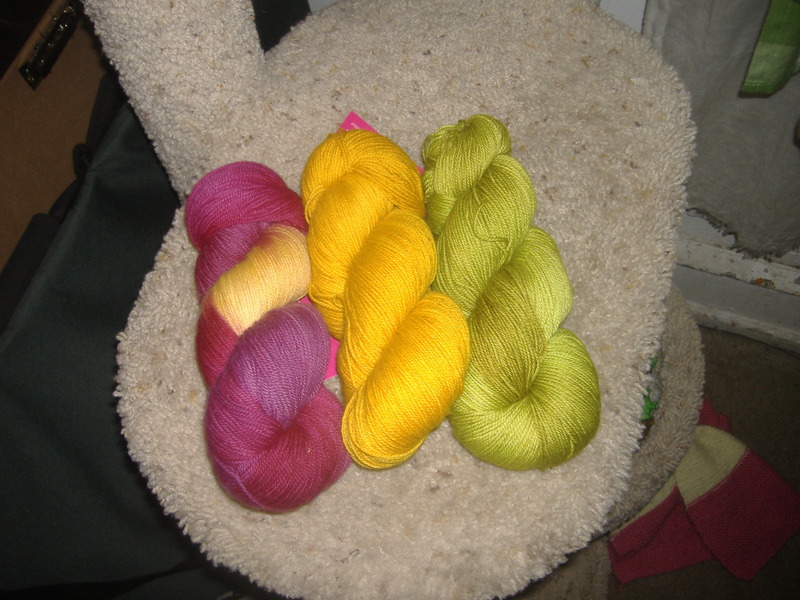 Beyond all expectations, the yarn I ordered on Friday around 5pm arrived Monday morning! Their easy to use site, the color picker which lets you see various yarns next to each other, and their delivery speed (always with a loto card and a roll of Smarties), are all reasons why I love shopping at Eat.Sleep.Knit, and now they carry Freia, which is drool worthy. Using the guide in the description page for The Doodler MKAL, color A is supposed to be the main color, “the leading role,” something that ,”has space to shine.” Color B is an accent color, “think about a pop of color.” Color C, well he says it best himself, “Color C joins the party fashionably late. It’s a color that demands to be featured. This could be a bold sassy color or something dark and dramatic.” These are the colors I’ve chosen side by side (as opposed to the thumbnails I showed you last week). I’m about half way through clue one. I was afraid when I saw the yellow in Honey Fig next to the Saffron and they weren’t the same shade, but the difference is working out really well and keeps the yellow in the Honey Fig separate from the Saffron. In order to start something new, I had to get something off the needles first. 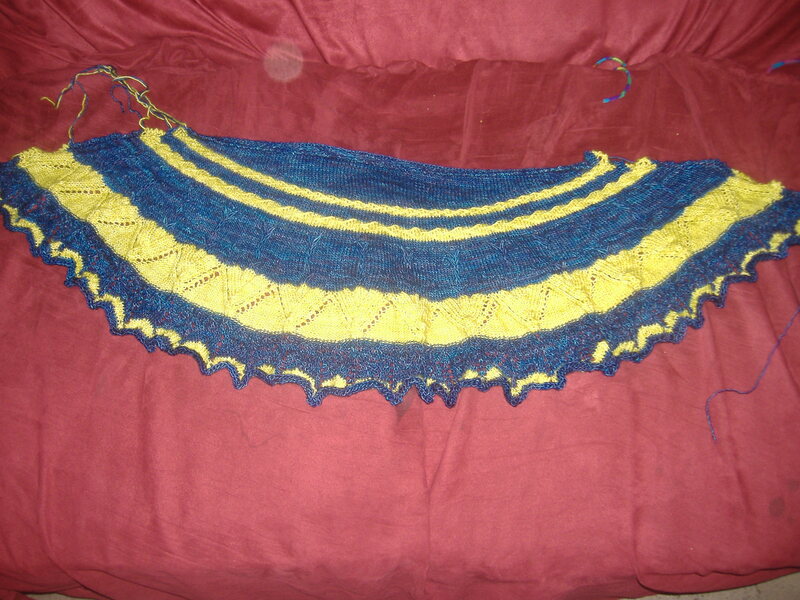 Yes, my Follow Your Arrow 2 shawl is finally off the needles! To be honest, I needed the cable before I started The Doodler, but all the knitting is finally finished and I got to try out Jeny’s Surprisingly Stretchy Bind Off (I used the video here to learn how to do it). It looks very messy to my eyes, so I’m not entirely sold on it yet over the Russian Bind Off that I usually used for shawls and such. We’ll see how it blocks out this weekend. I didn’t get any knitting done today, but I’m trying to get this clue for The Doodler done for Friday so I can start Clue 2 right away. Happy Knitting! 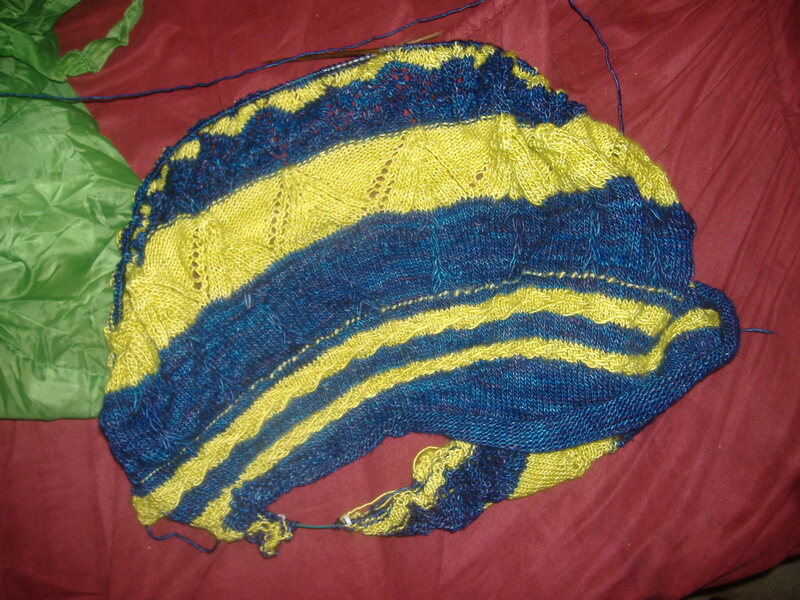 I’ve decided to jump in on yet another Mystery Knit Along. 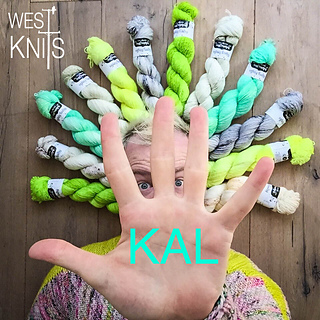 This time it’s Westknits Mystery Shawl KAL, The Doodler. Based on the advice in the pattern about color choices, I think I’m pretty good to go. After looking at it for a bit, I’m not one hundred percent sure about the Saffron, but I think it’ll work out. 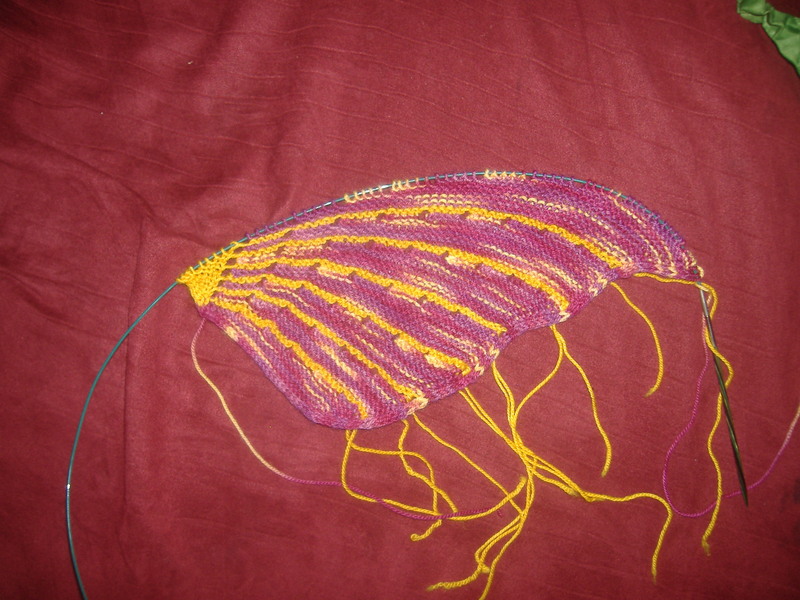 I should have it on Monday or Tuesday and since I’m almost done my Follow Your Arrow 2 shawl, I’ll be ready for this one. This is my, “I’ve quit smoking,” present to myself so hopefully this will keep me on the wagon. I hope it’s portable, because the Grass and Bubblegum shawl is strictly an at home project and I need something I can work on when I go out on Tuesday nights and riding the bus for long trips. I’ll let you know once I’ve gotten the first clue which is supposed to be out today.